VLADIMIR Putin was killed in a plot by the CIA and MI6 and replaced with a body double who still leads Russia, according to astonishing claims. Russia’s hardman leader Vlad is not the man we all thought him to be according to shocking theories which state the former KGB spook has actually been dead since 2014. Putin has remained a thorn in the side of the West as he made it his mission to return Russia to glory – first being made President back in 1999. But the current Vlad – who recently boasted Russia is now the most powerful country in the world – could actually be a doppleganger, according to conspiracy theories. Theorists claim dramatic changes in Putin’s appearance, apparent inconsistencies in his ability to speak German, and a divorce from his wife are all “proof” the Russian President is not the real Vlad. Astonishing claims circulated online – and explored in YouTube videos viewed hundreds of thousands of times and dozens of blogs and articles – assert the current Putin is a double most likely under the control of the CIA. Claims about when he was replaced vary – with some saying he was poisoned in the halls of the Kremlin after annexing Crimea in 2014. While other says he was quietly replaced in a secret coup in 2015 when Vlad mysteriously was not seen in public for 10 days between March 5 and March 15. 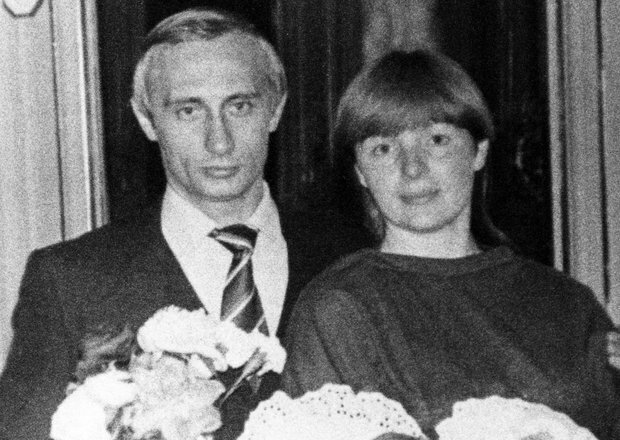 Putin announced a divorce from his wife in 2014, just after some conspiracy theorists – such as self-described “historian” Patrick Scrivener – claim he was killed in the Kremlin. An article circulated online – reportedly originally published in a German newspaper in 2015 – features strange quotes attributed to Lyudmila Putin which seems to support the theory of the death of Vlad. She is claimed to have said: ”My husband, unfortunately, has long been dead. The authenticity of the interview is unverified. Conspiracy theorist Scrivener claims “the one person who could expose the fake very conveniently disappeared” when referring to Putin’s divorce in April 2014. Scrivener – who also claims Abraham Lincoln’s murder was an inside job – goes on to claim Putin’s ability to speak German has also changed. Putin famously speaks fluent German and studied the language as a youth at Saint Petersburg High School. But images in 2014 showed him appearing to be using an interpreter while at a press conference with German chancellor Angela Merkel. Putin is wearing an earpiece in pictures, suggesting he is listening to a translation – something he would not need to do if he could speak German. Freelance journalist Jim Stone claims pictures before and after Putin’s disappearance show it is a different man leading Russia. He said the new Putin has a his “header rounder, nose fatter and shorter, dimple missing, lips thicker, mouth larger and a serious double chin”. Pictures of Putin in his youth do show a dramatic shift in his appearance. But there are also reports Vlad has at some point had plastic surgery – however conspiracy theorists argue this could just be a cover. His notorious disappearances are written off by most as problems with sickness. Rumours of Putin’s demise in 2016 were written off by the Kremlin as him responding to the “international situation”.